For every billionaire prepared to invest in a Bournemouth, there are half a dozen chancers ready to turn a club into a basket-case. Ask a Leyton Orient fan. That’s why those Posh fans currently waving their walking sticks in the air because they’ve been asked to pay £13 a match (half price in other words) to watch the team they support next season should be careful what they wish for. Posh record signing Britt Assombalonga. It’s also why this week’s news Darragh MacAnthony intends to stretch his ownership of the club well into a second decade should be celebrated. Managers (and assistants at the ABAX) come and go and are soon forgotten. Good players are waved on to better things and can (hopefully) be replaced. But a top-class owner/chairman? Much harder to find another one of those. In fact MacAnthony is by far and away the best chairman in Posh history. We’d be lucky to find another one like him. John Devaney (right) was chairman when Posh reached the second tier of English football for the first time in 1992. Six of the top 10 Football League finishes in Posh history have arrived in the MacAnthony era. Posh have spent three of the last eight seasons in the second tier of the Football League compared to two seasons in the previous 46 years under all other owners. Posh are currently enjoying their longest ever spell outside the bottom division. It will be 10 seasons and counting as long as Posh avoid a late collapse over the next few weeks. The top 10 transfer fees paid by Posh have all been signed off by MacAnthony including two in excess of £1 million. The total outlay on that top 10? Just the £6,750,000. Of course Posh have cashed in on the better signings as would any club who struggle to attract average home gates of 5,000, but MacAnthony also held on to his ‘holy trinity’ of Craig Mackail-Smith, Aaron Mclean and George Boyd longer than he needed to. That doesn’t much sound like a man more interested in profit than promotion. Those who love to assail the chairman after every loss should remember the above. Those (the club’s ungrateful seniors in particular) who ignore a man who kept admission prices the same after the last promotion to the Championship and who ignore the fact football will be cheaper for thousands of Posh fans next season, should keep quiet. They’ve had subsidised football for too long. 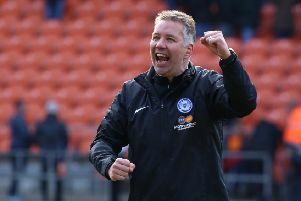 Of course Posh have fallen short of the standards set in Darren Ferguson’s time as manager. I don’t deny some of the games have been a hard watch, but to claim, as one long-time fan did to me last week ‘this season has been one of the ugliest of all time’, is quite frankly staggering. The complainant must have been asleep through the 1980s and much of Barry Fry’s difficult managerial period. Only two chairmen have ever guided Posh into the top two divisions of English football. One is still working hard for the club. How about helping him rather than whining?